….. Sold – July 2013 …. 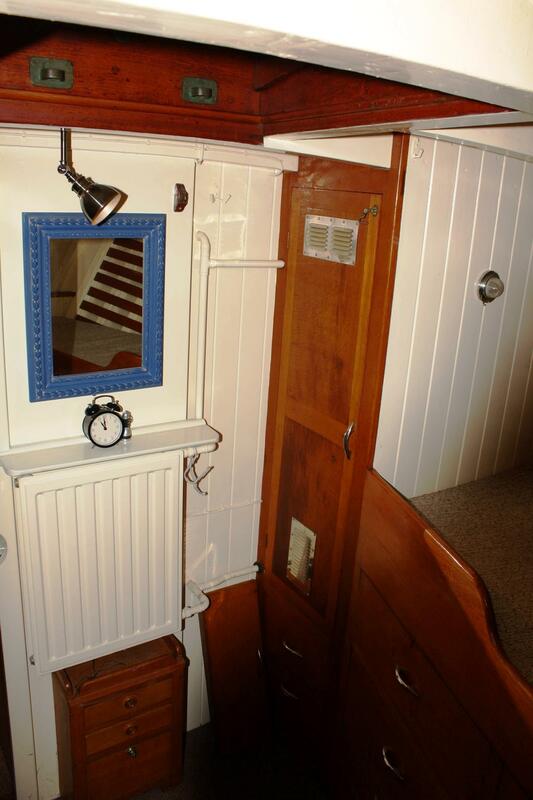 A 1959 KETCH RIGGED MOTOR-YACHT designed by Fred. R Parker and built by Nunn Bros. of Waldringfield, Suffolk to Lloyds 100A1 specification. FORTUNA II , designed by Frederick R Parker is an attractive Gentleman’s Motor-Yacht built in 1959 by Nunn Brothers of Waldringfield, Suffolk. Fred. 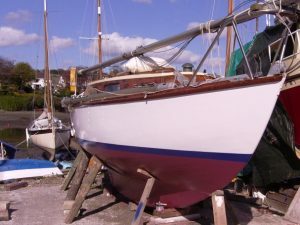 R Parker (1912-1984) affectionately known as FRP established, after the Second World War a solid reputation for sail and motor-craft – both racing and cruising. During the 1950’s and 1960’s he was the favoured naval architect at Moody’s with over thirty yachts built to his designs at Swanwick. FRP’s motor-yachts have attractive, pleasing lines and are sea-kindly capable vessels and as such are much sought-after. Nunn Bros. established in 1921 by brothers Harry and Ernie on the River Deben have a good reputation as traditional wooden boat-builders with the business now run by the third generation of the family. 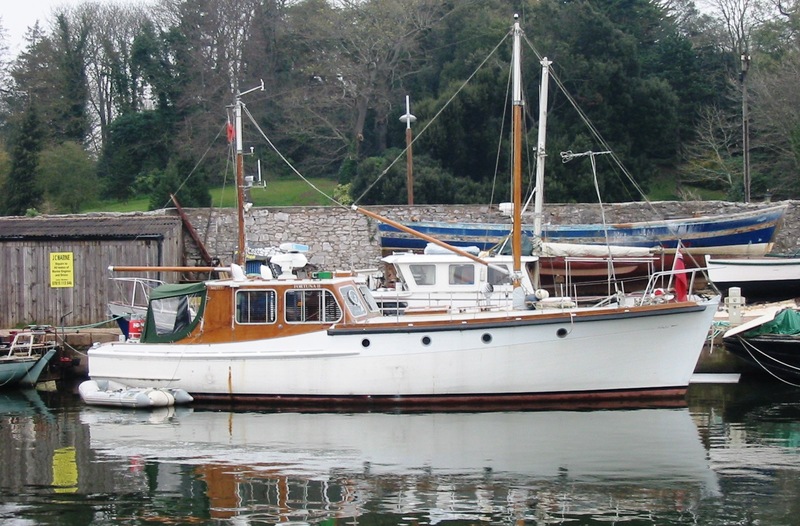 Fortuna 11 was built for Graham MacAndrew of Bury Hill, Woodbridge and was launched in August 1959 and registered the following June, classed Lloyds A1, grade 15. She remained in class until October 1973. 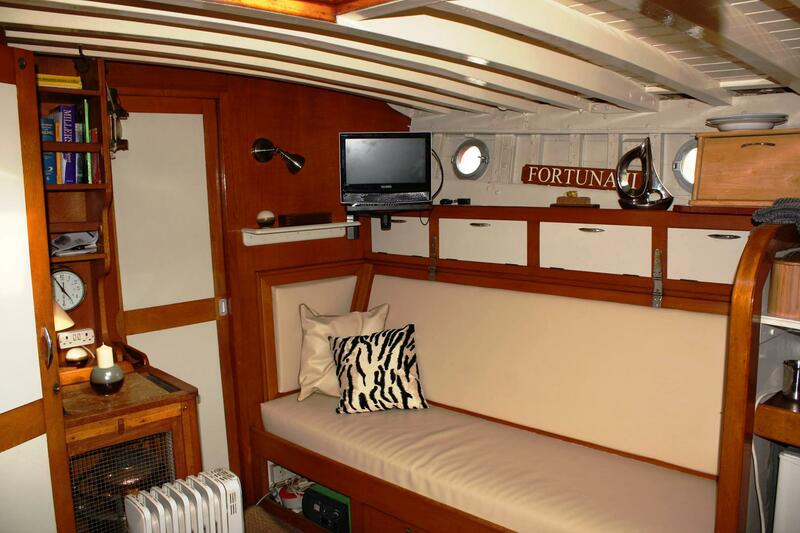 In the late 1960’s Graham sold Fortuna 11 to The Orwell Charter Company, who were based in Ipswich. The original 54hp Lister Blackstone diesel was replaced in 1973 by the present Man Diesel. 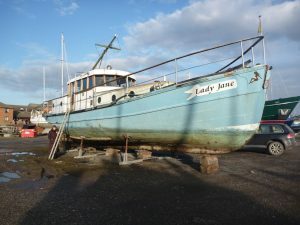 The charter company kept the vessel at Burnham on Crouch until 1975 when she was sold to Woodford Litho Ltd of London. 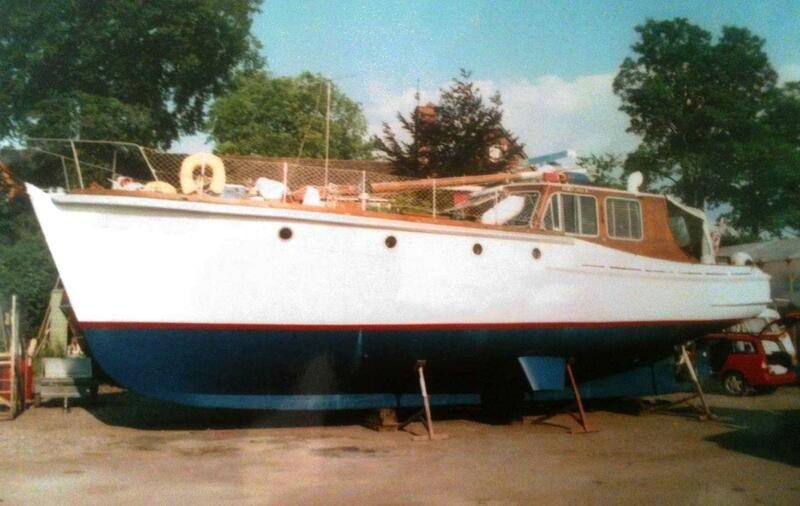 A few years later R V Fox of Spanbrook, Essex acquired Fortuna 11 keeping her throughout the 1980’s in Burnham. 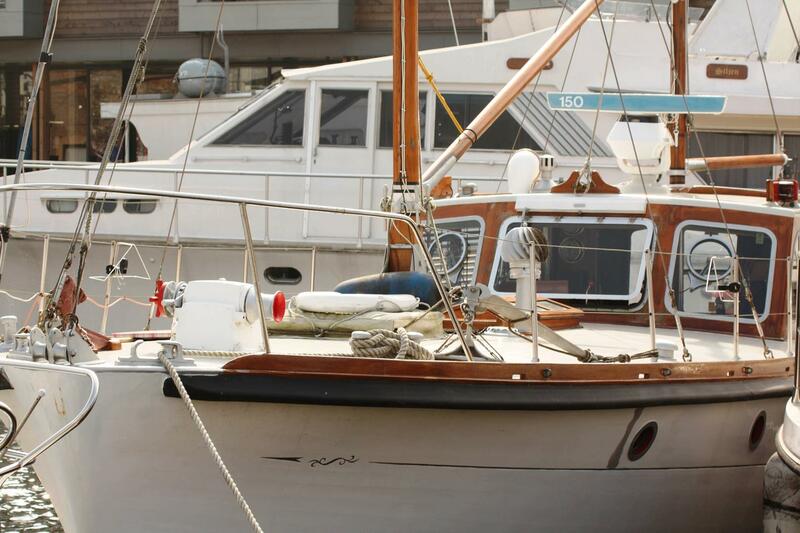 During the 1990’s John Trafford of London owned the vessel keeping her in Brighton Marina. Acquired by the current owners about ten years ago the vessel has been on the River Severn navigation and in more recent years the Exeter Ship Canal. From the board of the well known and respected designer Frederick Parker and built by the excellent yard of Nunn Bros. of Waldringfield, Fortuna II is truly a beautiful example of a classic “”gentleman’s motor yacht’ Originally constructed to Lloyds 100A1, she is an extremely comfortable and strongly built yacht with good sea-keeping ability. 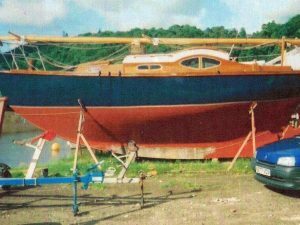 She was further improved at the outset by the bespoke installation of Vosper mini fin stabilizers- a rarely found and highly desirable feature on a yacht of this size. Fortuna II has been kept up to a very high standard and improved only where necessary. Builder 1959 Ernie Nunn, Waldringfield, Suffolk. 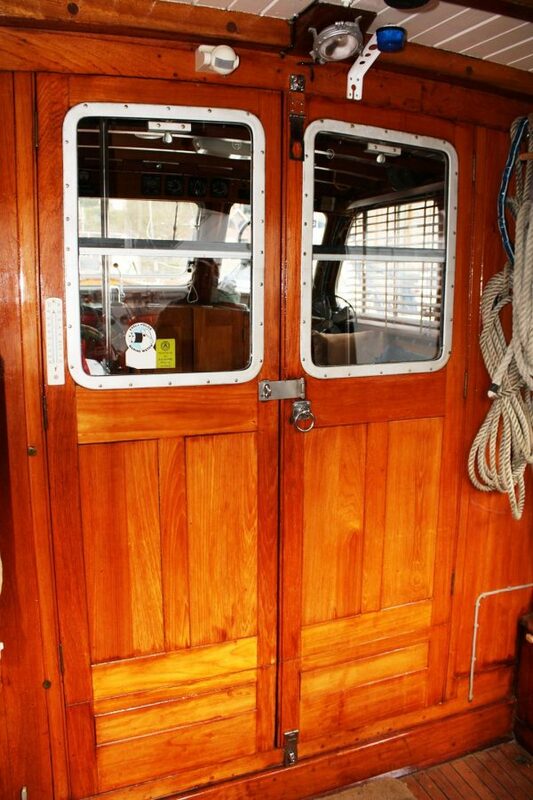 Heavy traditional all timber construction with 1.25″” pitch pine carvel planking on steamed oak timbers, oak grown floors and heavy oak centreline framing with mahogany transom. 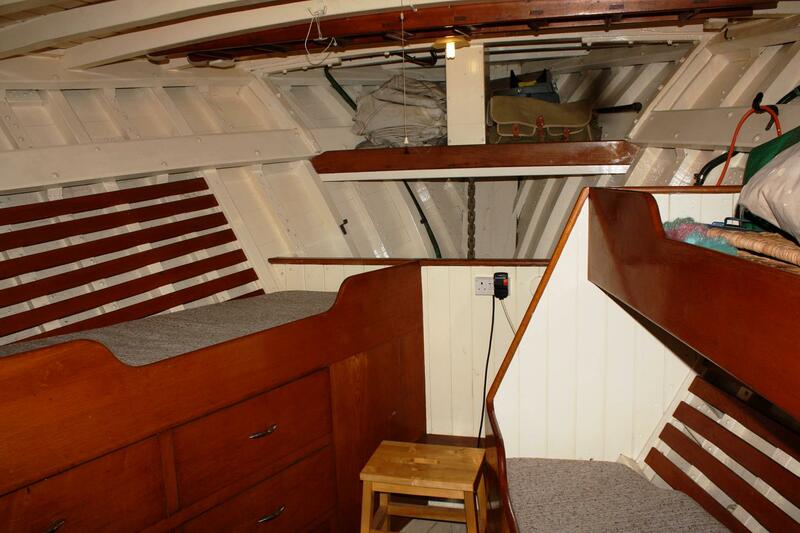 Cast iron ballast keel with keel hung bronze rudder. Solid pine mast and spars pine. 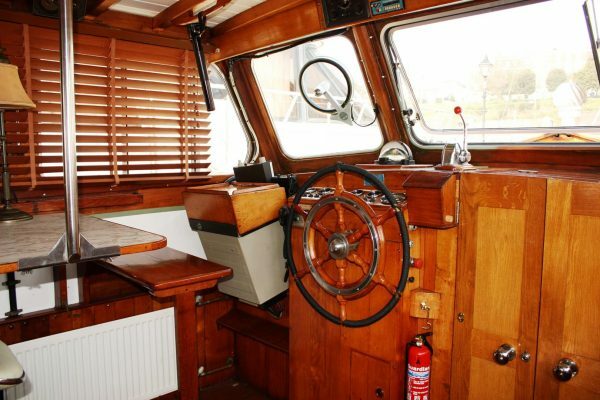 Teak wheelhouse and cockpit structure with pine fore, side and aft decks. 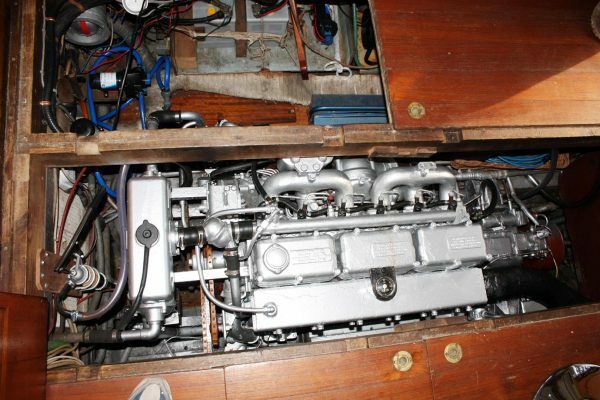 130 hp MAN D0846HM 6-cylinder marine diesel producing 130hp @2100rpm. To 2″ 316 stainless steel shaft (renewed 1999) with a four bladed fixed pitch bronze propeller. Fuel consumption of approximately 2.5 gallons per hour at cruising speed of 8.5 knots @1600rpm. Maximum speed 9.3 knots @2100rpm. Deck and anchor wash pump system off main engine. 24-volt main system with engine belt-driven alternator charging 2 x 12v. 220Ah batteries (new 2008) Mase 220 volt AC 1.5 Kw generator with 12 volt / 20 amp and 24 volt /15 amp. Output. 2 x Kent clear view screens and Wynn pantograph wipers. Sleeps seven in three cabins, or nine if the couchettes in the main saloon are used. Full standing headroom throughout. 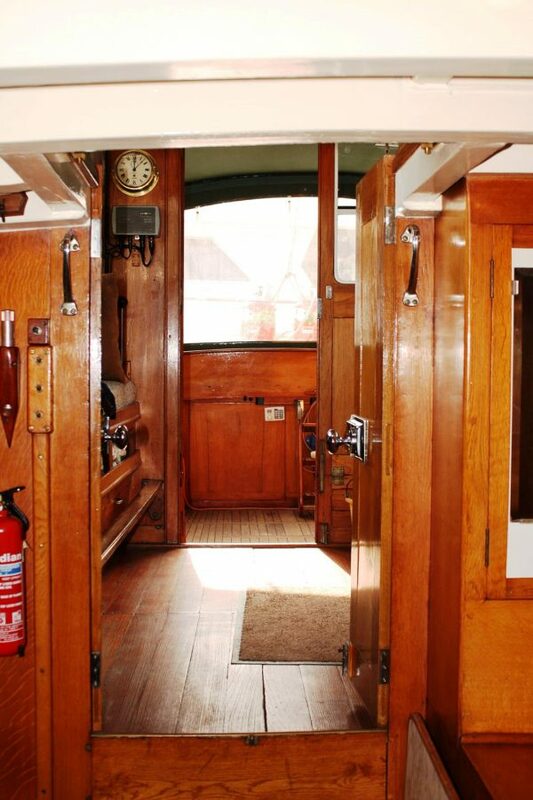 The beautiful panelled interior dÃ©cor in figured English Oak is in excellent condition with original oak joinery throughout having period chrome plated fittings. 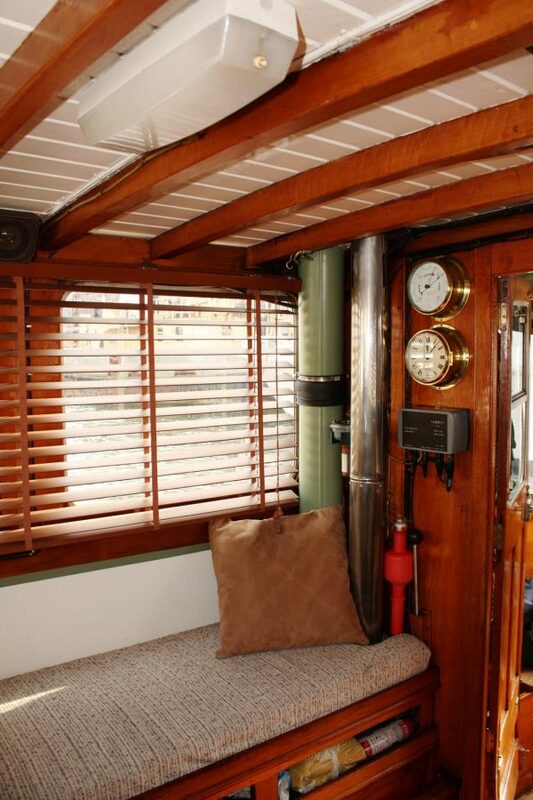 The saloon and forward cabins both have new carpeting and furnishings. 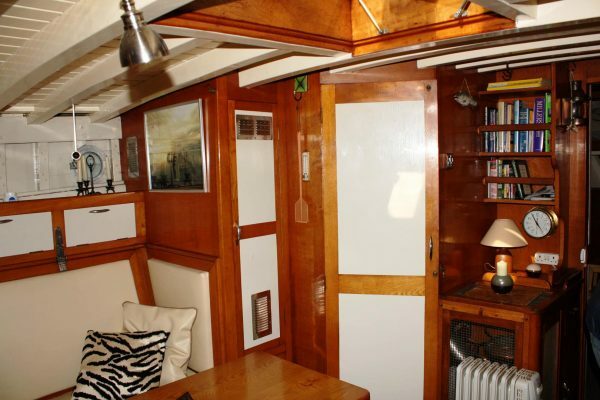 Forward Cabin: with a single berth to port and two single berths to starboard. Locker. The chain locker and stowage racks are forward. 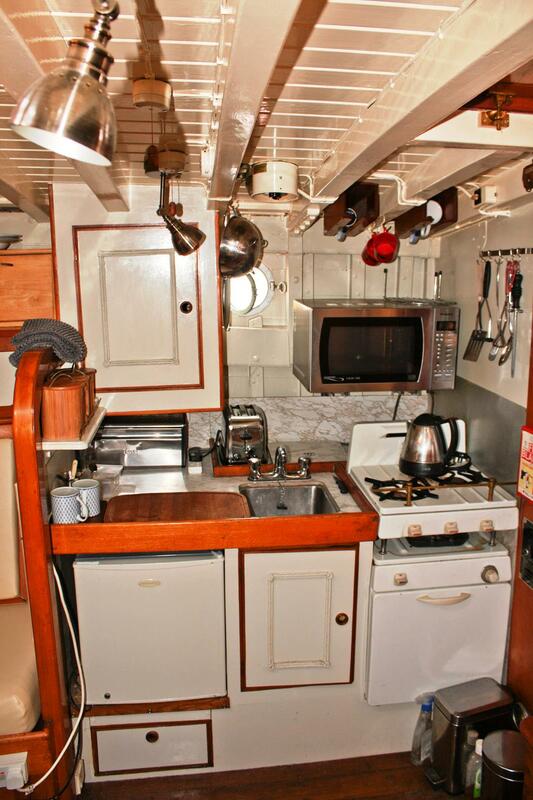 Galley: to starboard in main saloon with New World Cadet gas cooker with two top burners, grill and good sized oven. Electric extractor fan. Electric refrigerator, brackets in place for Microwave cooker, sink with hot and cold water supply, washing machine and dishwasher are to be found in aft Cockpit with all required plumbing. 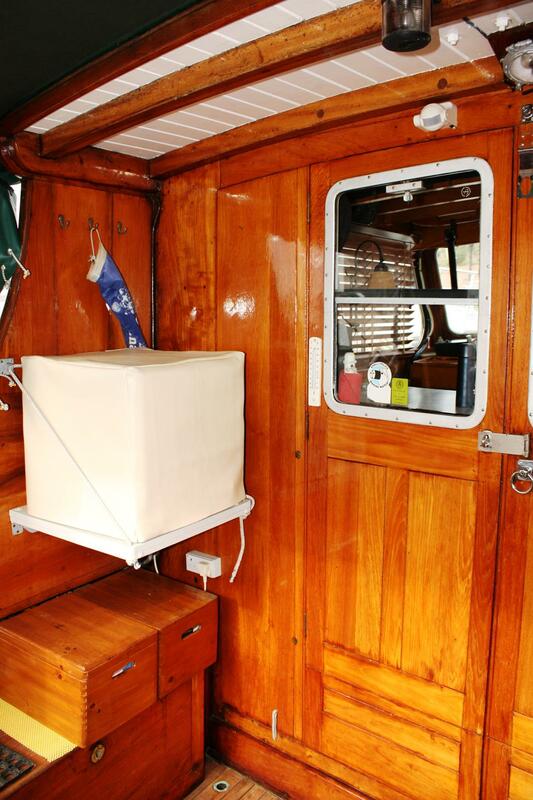 Heads Compartment: situated at the forward end of saloon on portside having a Rinnai gas water heater with ultra safe flame failure device, vented through deck, and complying with British Waterways safety regulations which serves heads, basin and shower plus galley. Shower tray with auto extraction pump plus manual override switch. (New shower extraction pump, new pressurised water pump with accumulator tank, fitted 2011 with new shower and mixer, and new tray.) 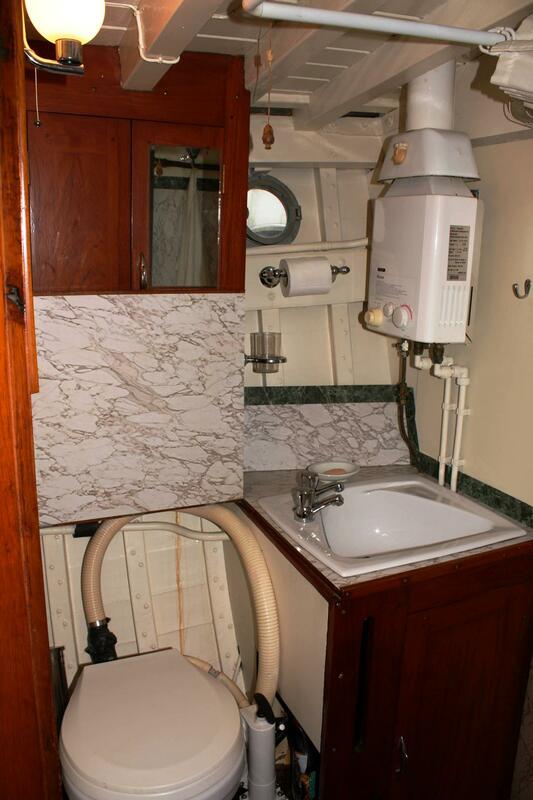 Fitted sea toilet, with large storage cupboard over and useful fold down top over the wc. 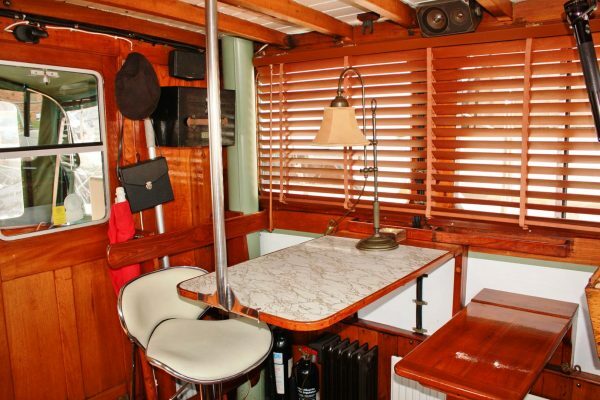 Wheelhouse: with access from the aft cockpit and passage down through into the saloon. Wooden Venetian blinds fitted to side windows for privacy. 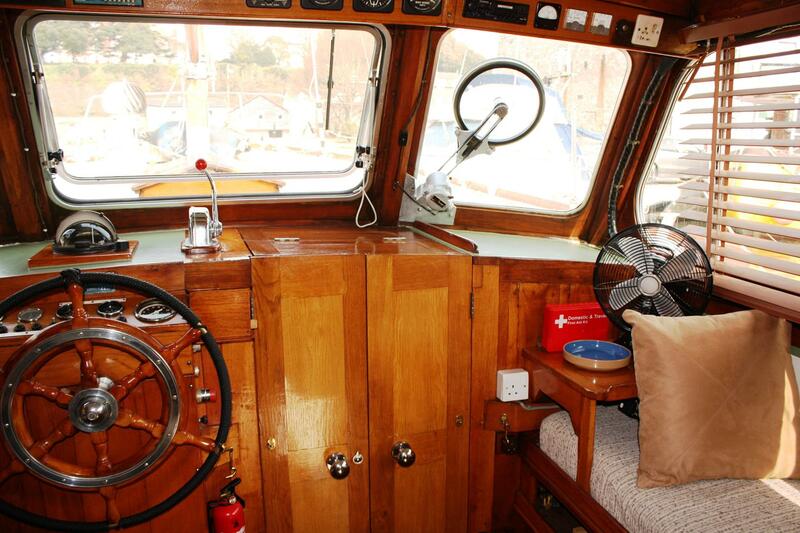 Centreline steering with full engine instrumentation and navigational equipment. The portside chart table is collapsible with two benches, one side, a settee / berth extends along the starboard side. Cockpit: situated aft with lockers to port and starboard, access to aft peak and overboard cockpit drains. New canvas canopy fitted 2011 with removable side and rear panels. 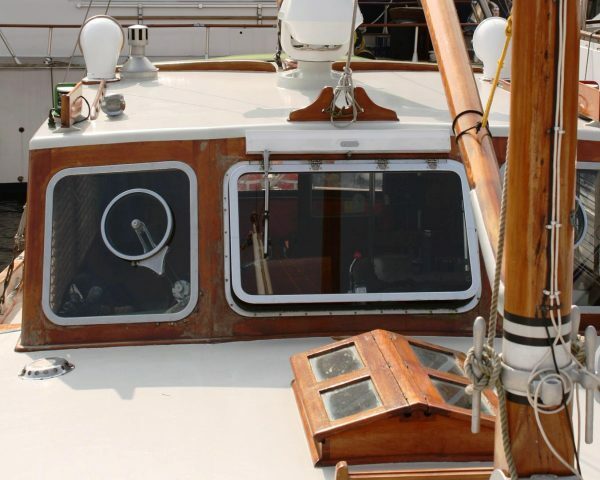 On deck the vessel is fitted with a stainless steel pulpit and stanchions with lifelines fitted around the raised foredeck. 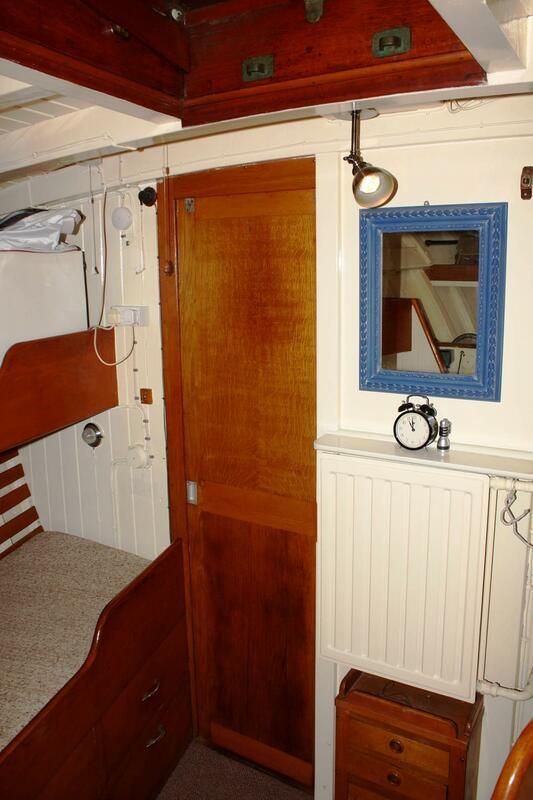 There is a handrail fitted to the wheelhouse top for use on side decks. Classic Yacht Brokerage have known Fortuna 11 for a good many years and would have no hesitation in recommending to buyers this sturdy, well built and capable vessel with a useful auxiliary ketch rig and spacious volume interior. 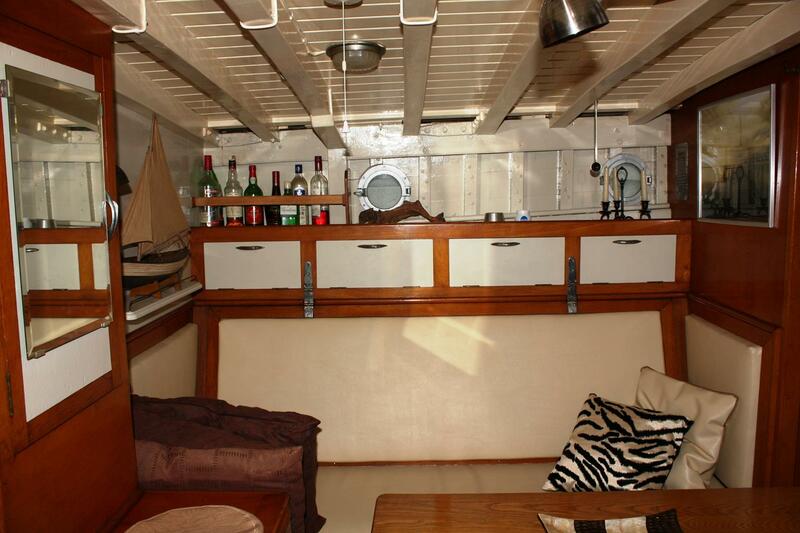 Maintained in good order throughout and ready for the 2012 season, Fortuna 11 offers stylish generous live-aboard / extended cruising accommodation. Rare opportunity.